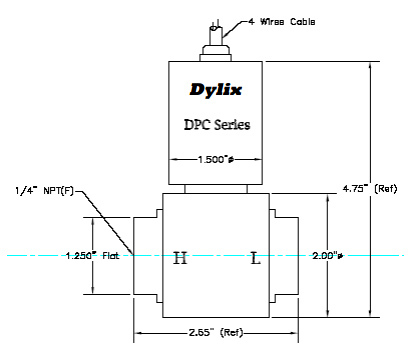 Dylix’s DPC Series differential pressure transmitter is designed for End Users and OEMs where extreme overpressure protection (1,000 psi), high performance and reliability are required at a competitive price. This product is modular and is configurable to meet our customer’s exact needs. Every DPC Series is built using advanced manufacturing techniques to ensure symmetry between the HI and LO ports. Symmetry, along with automated welding procedures and extreme environmental burn-in, give Dylix’s differential pressure products excellent performance and reliability over time and at high elevated line pressure. The DPC Series pressure port’s all welded 316 SST O-Ring free design make it ideal for high cyclical applications, capillary filled systems or applications where a guaranteed leak free system is needed. Includes a NIST traceable calibration certificate.